Some injuries,wounds and bloodshed that caused by Earthquakes, natural disasters, war, accidents, and other types of accidents or when they encountered a large number of bloodshed can not hemostasia quickly with dressing. As a result of gauze bandaging and dressing materials and other medical materials brought about by environmental pollution. Too much bleeding and blood plasma is not enough for patients and haemospasia store in Low-temperature storage that costing more..
Reducing the treatment time and cost of medical workers in dealing with the wounds and stop bleeding quickly and needless bandaging so it can be able to reach a new level of treatment. When haemospasia, the inconvenience to stop bleeding by cotton or other treatment. As the use of gauze dressings or bandaging that brought by environmental pollution, slowhemostasia and healing that vulnerable to infection, and prevent the body parts of the wound to be washed. Comfort and convenience of their own drops to dress their wounds, heal faster, reduce injuries. Family-owned, non-toxic and environmental. Find out from the nowadays market that the demand for above-mentioned adhesive is very large, the world as well as China are lacking for this product presently. For use, it's convenient and rapid bleeding and healing, the family-owned, science and self-cure. Function£º	Quick hemostasia and healing to promote new skin growth. 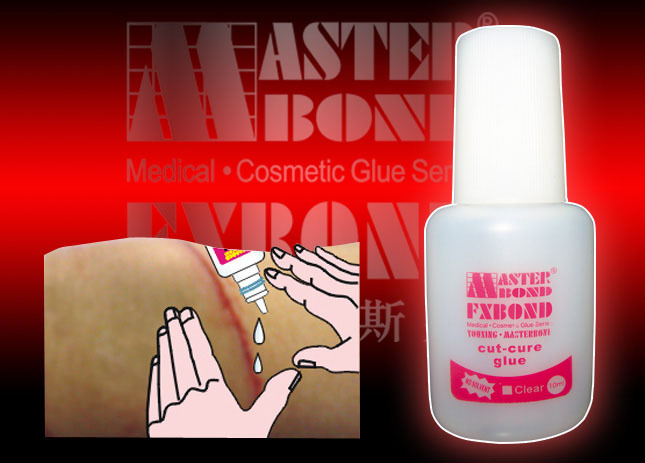 Usage£º	Clean the wound surface then squeeze out or spray the adhesive on it. Copyright© YouXing Enterprise (ZHONGSHAN)Adhesive Co.,Ltd All Rights Reserved.